In the early 19th century, moving panoramas were popular throughout the United States. An ever-changing landscape was revealed gradually, so viewers absorbed the spectacle as they might from the deck of a steamboat or the seat of a covered wagon. By introducing audiences to the beauties, adventures, and commercial potential of the American frontier, the moving panorama promoted immigration, advertised for commercial expansion, and provided pure entertainment. The earliest panorama of the Mississippi was probably developed by Samuel Adams Hudson in 1838. Like its successors, Hudson's panorama offered spectators a vicarious trip downriver. Each scene was explained by a narrator, to the accompaniment of piano music. Hudson's panorama was followed immediately by that of John Banvard, an itinerant painter who traveled the Mississippi Valley during the 1830s and 1840s. Banvard's dramatic work, consisting of thirty-nine scenes, was billed as "The Largest Painting in the World." Even as Banvard took his tour de force to London, other enterprising painters produced their own contributions to this lucrative genre. Among the best known were Henry Lewis's panorama depicting the natural and commercial life of the river, and John Egan's work illustrating the river's history and archaeology. Also noteworthy was a panorama planned by the Austrian painter Franz Hölzlhuber, illustrated here by some of his preparatory watercolor sketches. 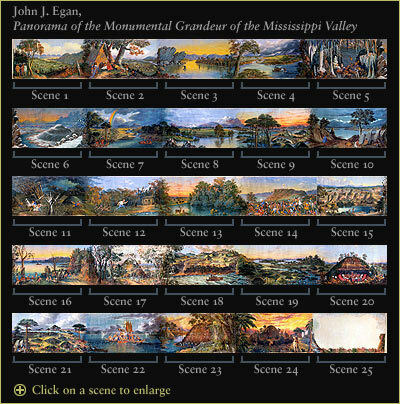 Egan's panorama of the Mississippi is the only one remaining today.